SEC and Neutral Site Agreements: Playing Smart or Playing SCARED? “It’s our way or the highway” — this seems to be the mantra coming from SEC title contenders when it comes to non-conference scheduling. The Pac-12 wants certain SEC teams to agree to a home-and-home series, but that isn’t what they are going to get. Is the SEC playing smart or playing scared? Let’s dive into the neutral site agreement conversation. It is well publicized that on September 1st the Washington Huskies are playing the Auburn Tigers at a neutral site in Atlanta, Georgia. Many, if not all, college football experts say it’s all on the line for the Pac-12 and UW. If the Huskies drop to Auburn, the Pac-12 will have no hope for a playoff appearance come January, at least that’s what they say. With a game so important, why the neutral site? This year, Ole Miss is playing Texas Tech at a neutral site, Alabama is playing Louisville at a neutral site, Texas A&M plays Clemson at home, and LSU plays Miami U at a neutral site. The Ducks just solidified a match-up with Georgia at a neutral site for 2022. Do you see where I’m going with this? Darron Thomas vs. LSU at AT&T Stadium in 2011. The entire football nation, media, and fans declare the SEC the strongest and best college conference in the football world, yet for some reason, all these games are played in SEC territory. So why won’t they play a home-and-home series like the rest of the college football world does? After some research, I found sometimes they do, and I do mean sometimes. What’s even more rare than a home-and-home series with a Power 5 school, is a home-and-home on the West Coast. You have to go back to 2011 to find the last time Alabama played a home-and-home series with a Power 5 conference foe, and it wasn’t the Pac-12. LSU played a home-and-home with Washington (2009, 2012), as the Huskies were coming off of a 0-12 season. Yes, win-less. Yet somehow, UW took LSU down to the wire at Husky Stadium in 2009. UCLA vs Texas A&M (2016, 2017) and Cal vs Ole’ Miss (2017, 2019) are the most recent examples of SEC vs Pac-12 home-and-home agreements. Texas A&M lost both games to UCLA, and Ole’ Miss lost on the road at Cal. Ouch! It’s a risky business in the NCAA college football world to agree to a home-and-home series. To send your elite, playoff-contending teams out west for them to put it all on the line seems completely unnecessary, at least to the Southeastern Conference. Why would teams like Alabama, Georgia or Auburn travel west when they can strong arm the competition into neutral site agreements, without having to play at Autzen or Husky stadium? Both places are ranked in the top 10 for loudest places to play in the country, by the way. It seems to me that the SEC will only schedule tough opponents when the scheduling and environment is in their favor. Every single year the “top SEC” teams are perfectly in place for the playoffs using this format of tough non-conference games at “neutral” locations. Let’s be real for a second. Everyone knows Atlanta isn’t a “neutral” location for anyone outside of the SEC. Playing in the Midwest would be my definition of neutral. Not down the street from campus. Can you imagine how crazy the fans would be at Autzen for an SEC team? Can you imagine how different the Washington versus Auburn game would be if the Tigers played in Washington? Or how exciting it would be to see the Bulldogs come to Eugene? After all, it is well accepted in the football world that the home team gets 3 points. I’d say, in places like Autzen and Husky stadium, it’s more like 5. With the losses that Ole’ Miss and Texas A&M took in recent years, it seems the SEC is using “risk analysis” and strategically placing the upper echelon of the conference in the best possible position for National Title contention. It seems Auburn playing in Washington or Georgia at Oregon is a risk the SEC is unwilling to take. 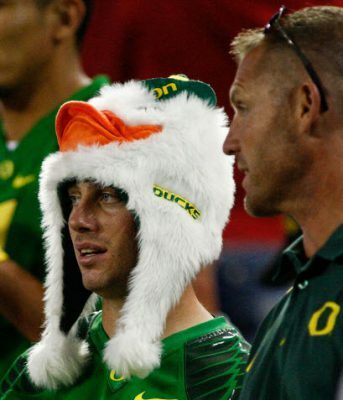 Refrain from pounding on the desk saying that Oregon has the weakest non-conference schedule of anyone in all of college football, and that a Duck fan has no room to talk. 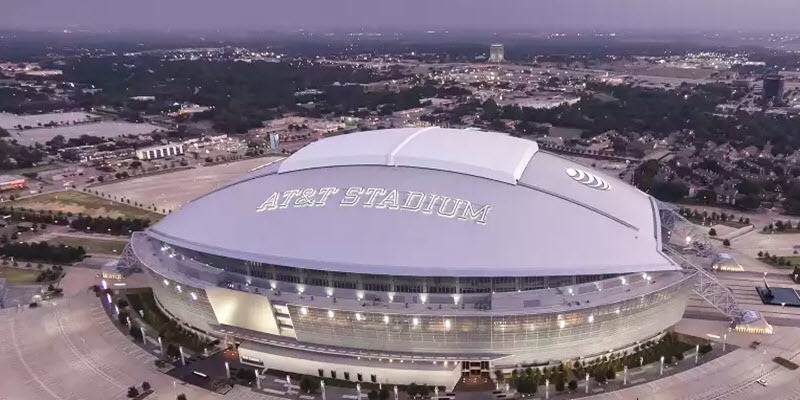 In 2014, Texas A&M backed out of a home and home agreement with the Ducks. A&M invoked a clause in the contract because it was changing conferences, joining the SEC. Therefore, Rob Mullens was left scrambling for a short-notice opponent and unable to fill it with a marquee match-up. 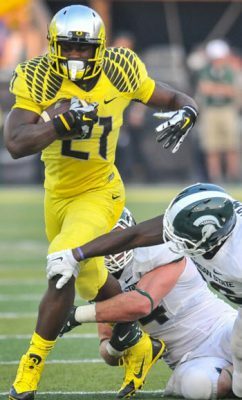 Royce Freeman and the Ducks had a tremendous series with Michigan State. In 2013, Alabama backed out of a home-and-home series with Michigan St. (They cited uncertainty in SEC scheduling). Others may say it wasn’t aligned with risk mitigation at a neutral site deep in SEC territory. It’s also worth noting that the Pac-12 plays 9 conference games and 3 non-conference games to complete it’s 12-game slate. On the other hand, the SEC plays only 8 conference games and the SEC does not include a 2nd Power 5 opponent for this additional non-conference game, as they just add another cupcake, usually late in the season. No other Power 5 conference takes on this philosophy. The SEC scheduling strategy is securing one prime time game at a neutral site, followed by two non-conference pillow fight match-ups. Enter conference play and then sprinkle in a third soft match-up late in the season. This scheduling format virtually eliminates tough road games against a Power 5 opponent on the West Coast for the SEC elite. You would have to conclude that the SEC is finding every way possible to avoid the home-and-home series agreements with the Power 5 conferences, especially the Pac-12. Sorry, Husky and Duck fans. Getting the SEC to come into our house isn’t going to happen in this modern “playoff era.” The risk far outweighs the reward. You can say it’s strategy, but I say they’re scared to play on the West Coast, and that’s a trend that is unlikely to change.